Metro Diner is Open For Business! STUART — This new restaurant is all about comfort food. 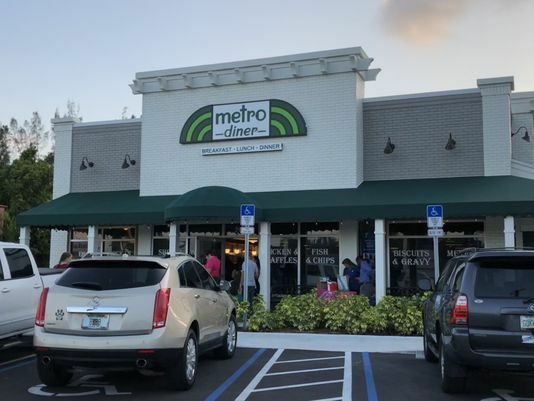 The Treasure Coast’s first Metro Diner opens Tuesday at 2660 S.E. U.S. 1 in Stuart with large servings of dishes such as fried chicken and waffles, chicken pot pie and shrimp and grits. Most dishes are under $15. “It’s comfort food with a flair,” said Lance Hickman, managing partner of the Stuart Metro Diner. “We’re unique in that we serve a full menu all day long.” The 3,685-square-foot diner also serves beer, wine, mimosas and Bloody Marys. The restaurant is the first business to open in Baron Shoppes, which replaces the former Wallace Chevrolet on U.S. 1 near Monterey Road. Other businesses coming to the plaza include Firehouse Subs, Moe’s Southwest Grill, Great Clips, Paradise Car Wash, Jupiter Medical Urgent Care and Eyeglass World, said Jeremiah Baron, owner and president of Jeremiah Baron & Co. Commercial Real Estate.